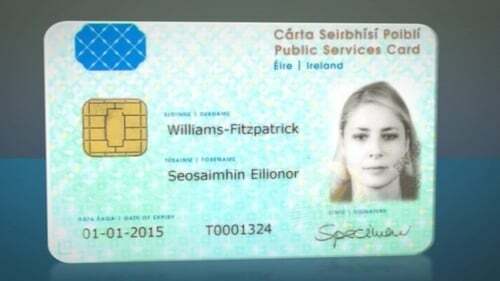 The Department of Social Protection has said it is confident there is a clear legal basis for the Public Services Card. It comes after the Irish Council for Civil Liberties and other experts questioned its legality and whether it complied with GDPR regulations. The card was brought in to provide a way for people to access official services across Ireland without needing to give the same information to different organisations. It was initially introduced by the Department of Social Protection in 2012 for people claiming social welfare payments in an effort to tackle fraud. Later, it was announced as the preferred proof of identity for other public services such as a driver licence and all first time passport applicants. However questions have been raised about whether the card fully complies with the law. Liam Herrick, Executive Director of the Irish Council for Civil Liberties said: "We have had concerns that a scheme that was originally established to be about social welfare payments and making it more easy to access social welfare payments has over time expanded very dramatically to take on many of the characteristics of a national ID card system." "We think that's a very significant issue about citizens rights and privacy rights and we think that the Government hasn't been honest with the people about putting before them in a clear proposal what it has done. "A huge amount of public money has been spent on this over the years with a question mark around the legality and there's been a refusal to engage with legitimate concerns from members of the public." Simon McGarr, Solicitor and Director of Data Compliance Europe, said there is a risk the card is unlawful under General Data Protection Regulation (GDPR). "It also contains biometric data, images of people's faces that are taken in a particularly controlled environment so that those photographs are capable of being out into software, scanned and that people's faces can be recognised if they are put through video feeds and they can be matched off automatically. "Article 4 of the GDPR specially says facial images are biometric data, Article 9 of the GDPR specifically says it is illegal to process biometric data." Last year, the Department of Transport made a U-turn on making it a mandatory requirement for people to use the card to apply for a driver licence or learner permit. Mr Herrick said there has been confusion over what the card is needed for. "Some of the agencies who were using the card have now stopped using the card, some are continuing to roll it out, some individuals are going to public services and being told that they need the card to access the services, others are going to the same services are getting a different response. "There has been many cases where people have had their social welfare payments or pension payments cut off and yet when they have challenged it those payments have been returned so now I think we have a very uncertain and confused picture." The Data Protection Commissioner has carried out an investigation into whether the public services card system is legal. Graham Doyle, Head Of Communications at the Data Protection Commission, explains why the decision was made to open an investigation. "Safe registration results in large scale data collection by the department, we decided to open an investigation to establish if there is a legal basis for processing and sharing data in connection with safe registration and the public service card itself. "We are also examining if there are appropriate security measures implied in relation to the personal data processed, in relation to the registration of the card and also to evaluate the information that has been made available to the public and whether this information meets the transparency requirement of data protection regulation." Asked if the Commissioner has plans to publish that report, Mr Doyle said a summary of the final findings would be published at an appropriate stage. In a statement to RTÉ News, the Department of Social Protection said the Social Welfare Consolidation Act provides a legal basis to require a person to produce a Public Services Card at the request of a specified body for the purposes of a transaction. It said these bodies have the right to require the card to confirm a person’s identity. The department also said it is satisfied that it has a clear legislative basis for its processing activities, in particular in relation to the issuing of the Public Services Card and is GDPR compliant.